Use the slideshow mode to view the photos. They show up much clearer with far better detail. Unless identified otherwise, most of these photos were taken at Boy Scout Woods blind and drip in High Island, Texas in April 2011. High Island is a major migration corridor in the spring for birds moving into North America from Mexico and South America. Tired from a non-stop flight over the Gulf of Mexico, they are anxious to find rest and food. High Island rises a few meters above the flat beach as a result of being over a natural salt dome. The birds see it from way off and gravitate in huge numbers. Over time, bird lovers have groomed the island's plants and landscapes as a purposeful haven for the weary travellers. This gallery has more repeat species than I normally post, but I wanted to show color variants of male, female, immatures and effects of water and flash on the feathers. I had the good fortune of having captured some of that. Conditions on two of the days bordered on a mild fallout, which helped make it a great season! 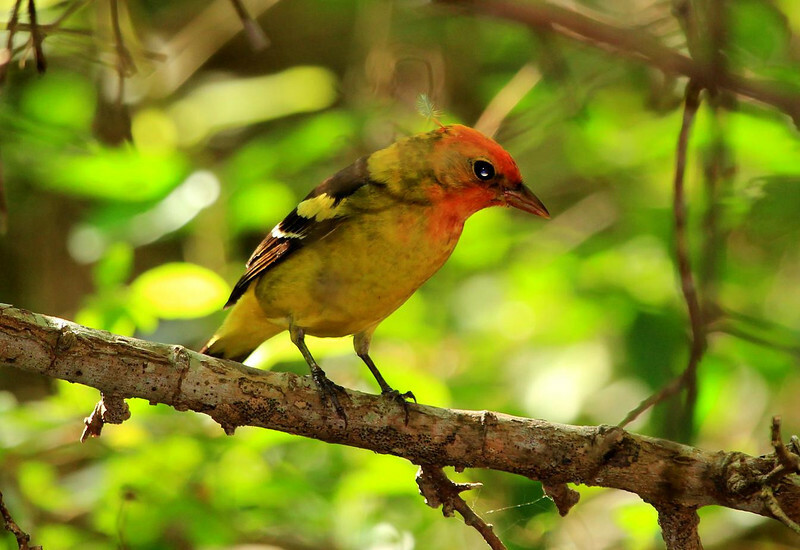 Immature Western Tanager, High Island, Tx. April 2011.